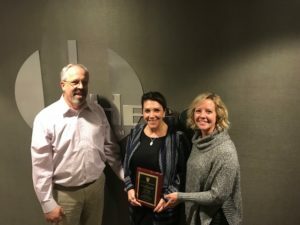 Sarah Maag, Director of Sales for the Hilton Garden Inn Downtown Sioux Falls, was one of two recipients honored with the 2017 Employee Service Award by the South Dakota Hotel and Lodging Association (SDHLA). SDHLA presents the annual Employee Service Awards in order to encourage and recognize outstanding customer service in the lodging industry. The awards are for employees or managers who demonstrate outstanding performance – above and beyond normal job duties – and consistently provide exceptional customer services.